Hi there! And welcome to today’s episode of Reducing My Samples Stash. I have lots of fragrance samples that I need to get on top of. So I picked 3 random fragrance samples to test and review. And I’m starting with Katy Perry Killer Queen. 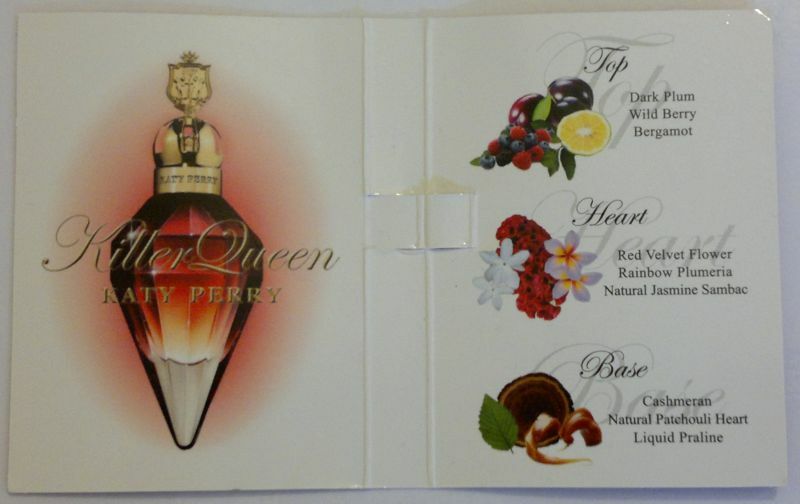 Killer Queen contains the following fragrance notes: dark plum, wild berry and bergamot (top notes), velvet flower, rainbow plumeria and natural jasmine sambac (heart notes), and cashmeran, natural patchouli heart and liquid praline (base notes). What’s Killer Queen like? It’s a simple fragrance. An incredibly sweet one. It smells like a mix of plum, dark chocolate and patchouli. I can see that this fragrance might appeal to women who aren’t really into fragrances, but who like sweet fragrances nonetheless. I’ll pass the sample on to a young relative – I’m sure she’ll be happy to finish it! Sample number 2 is Etienne Aigner Clear Day (the sample on the left in the picture below). Clear Day features the following fragrance notes: apple, yuzu, mandarin and bergamot (top notes), melon, strawberry, peach, jasmine, magnolia and rose (heart notes), and chocolate, caramel, leather, musk, woods and vanilla (base notes). I think Clear Day smells like a more dated version of Hugo Woman! It’s Hugo Woman with extra musk, soap and leather. I would describe Clear Day as a light yellow, feminine, fresh and optimistic fragrance that’s very suitable for day wear (office, day off, weekends, all seasons). I wouldn’t buy a full-size bottle, but I will finish this sample. 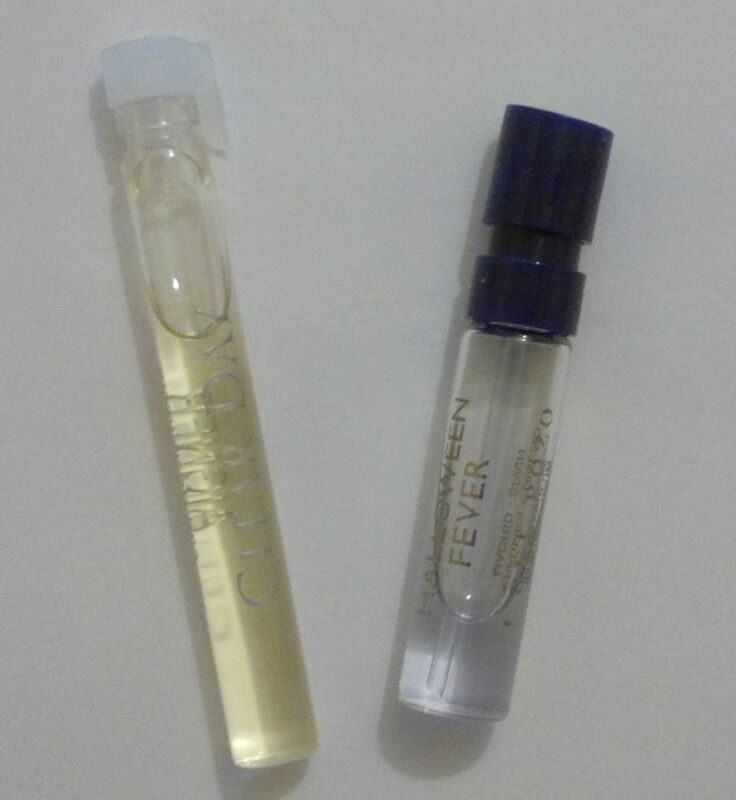 And the third sample is Jesus Del Pozo Halloween Fever (the sample on the right in the picture above) which features the following fragrance notes: orange, bergamot and rose (top notes), apricot, jasmine, lotus and ylang-ylang (heart notes), and vanilla, musk, tonka bean and patchouli (base notes). I think that Halloween Fever isn’t very special. It smells like lotus or waterlily hand wash. I mean it! Over the past 15 years I’ve bought several cheap hand washes and shower gels that smelled pretty much like this fragrance. I hope my teenage relative will be happy to finish this sample.